Slavery and coerced labor have been among the most ubiquitous of human institutions both in time - from ancient times to the present - and in place, having existed in virtually all geographic areas and societies. 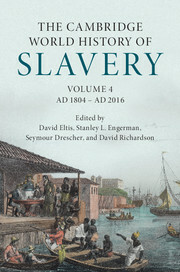 This volume covers the period from the independence of Haiti to modern perceptions of slavery by assembling twenty-eight original essays, each written by scholars acknowledged as leaders in their respective fields. Issues discussed include the sources of slaves, the slave trade, the social and economic functioning of slave societies, the responses of slaves to enslavement, efforts to abolish slavery continuing to the present day, the flow of contract labor and other forms of labor control in the aftermath of abolition, and the various forms of coerced labor that emerged in the twentieth century under totalitarian regimes and colonialism.